It’s an unlikely scenario: people from various tribes coming together to seek God’s face for peace in their country. It’s a story about South Sudan that likely won’t be on the cover of newspapers or making media headlines, as fighting and food insecurity continue to be the most popular topics. 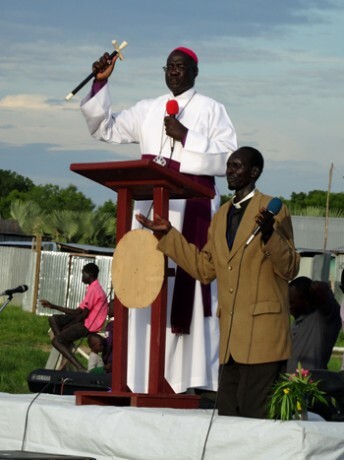 Local church leaders are coming together in South Sudan to unite the body of Christ. However, this gathering of people is happening, and it’s a story that should be shared. It’s one that brings glory to The Maker of the Universe and serves as a hopeful reminder that God indeed is at work. The Prayer Initiative, facilitated by Samaritan’s Purse and local church leaders, mobilizes prayer from churches, Christian prayer groups, and networks in South Sudan. The initiative aims to see the Body of Christ from all denominations and tribes come together to worship, discuss differences, extend grace, reconcile, and, most importantly, commit to being one in Christ Jesus. 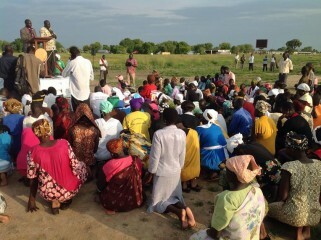 Led by local church leaders, the Prayer Initiative is making its way throughout South Sudan. An event recently was held in Bor, a town that experienced horrific violence and tragedy during the initial months of the conflict. Many innocent lives were lost, and families were torn apart as a result of the heartbreaking conflict that took place in the town. But God knew destruction and fear would not have the final say; He had a bigger plan. A woman who hadn’t spoken to her husband (who is from the warring tribe) since the conflict began has now relinquished bitterness and reunited with her spouse as a result of praying for peace during the days of the event. “I have seen the light of hope during this prayer event, and I now have peace in my heart,” she said. The people in South Sudan have been struggling through atrocities for several years. The Pray Initiative is working to stop the violence. Her story is just one example of God’s work in South Sudan and is proof that through prayer, forgiveness is possible. Nearly 3,800 people attended the three-day event in Bor, including high-level government officials. Not one tribe, organization, or church is being lifted up through the Prayer Initiative—only the name of Jesus Christ. Even in the midst of tragedy and conflict, God’s glory reigns as people from all tribes come together to seek peace, healing, and reconciliation.